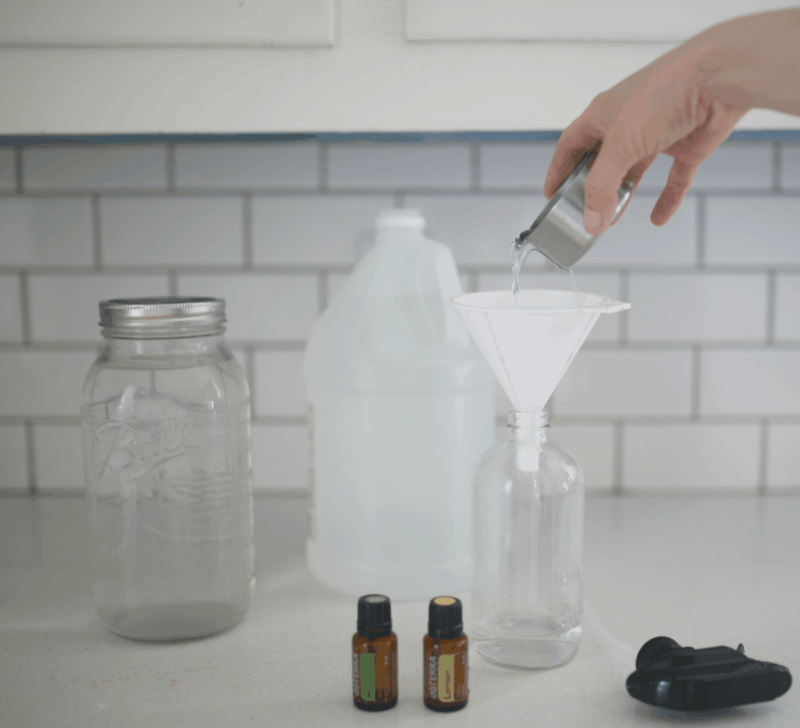 Learn how to make an all purpose DIY purpose cleaner with essential oils. I also have a free eBook as well. I’ve been really skeptical of the chemicals in traditional household cleaning products for many years now. But, more lately, my sister and I have actually been researching the ingredients and their effects on the body. The findings are alarming, to say the least. The average American is exposed to 500,000 chemicals every day. Toxic cleaning products cause indoor air pollution, a problem which is only made worse in homes where the windows are never opened. So we are literally spraying our house down with carcinogens, and then trapping them in so they have no where to go, but in our bodies. Not exactly a situation I want to create in my home full of young children! For the past few years I have been content to clean my counters, bathroom, floors and kitchen sink with Norwex microfiber cloths and good old fashioned water. I still love my Norwex cloths, but sometimes I want that clean smell too. And, about once every week, I need something a little more powerful. 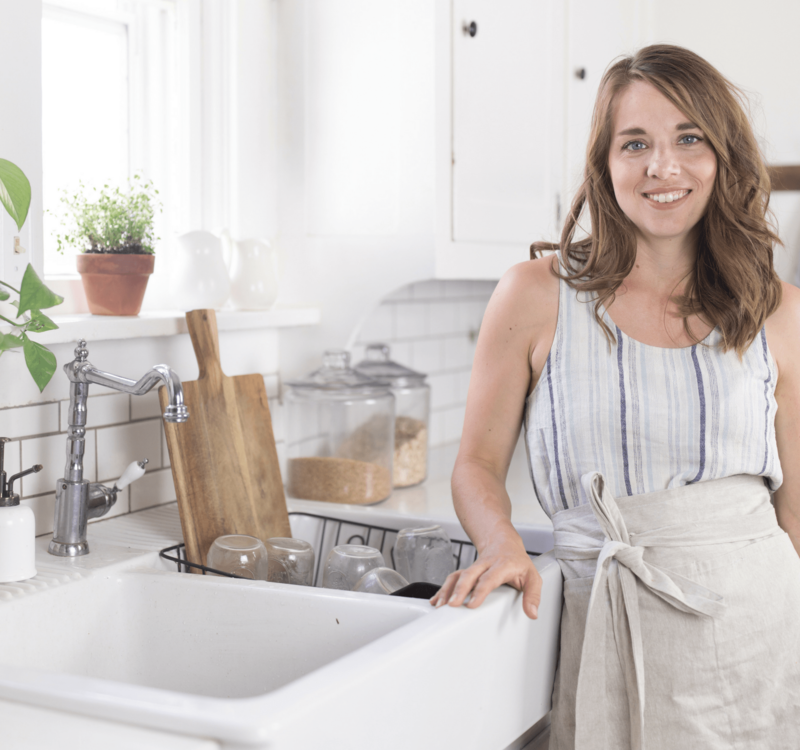 Soap scum, grape juice counter top stains, and burned on food on the stove top, all require a little too much elbow grease with microfiber alone. 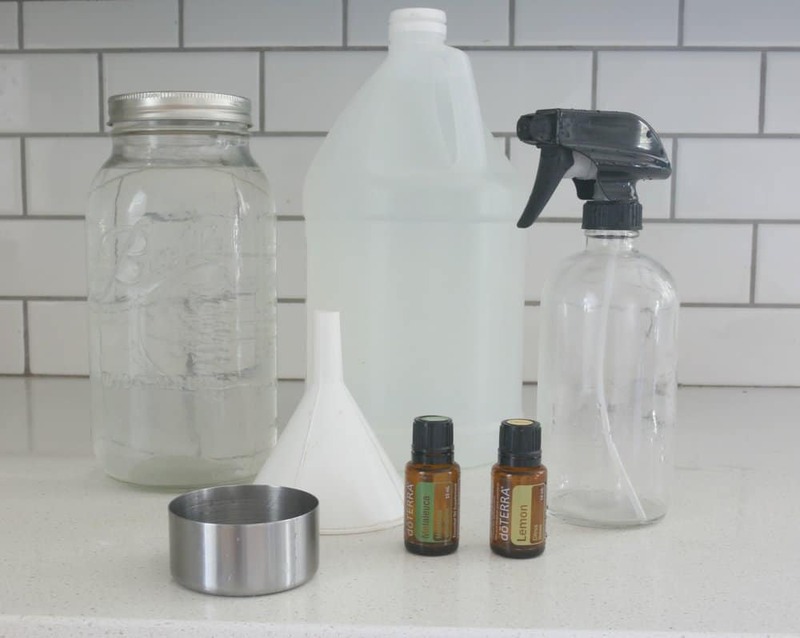 This simple four ingredient all purpose spray is nontoxic and effective for those difficult household messes. 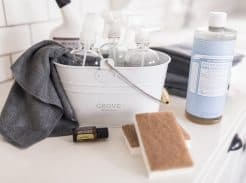 Instead of filling my home with toxins, this cleaning product actually releases molecules into the air that are beneficial to the body! Melaleuca is best known for its purifying properties. It is naturally antifungal and antimicrobial. Lemon is a powerful cleansing and purifying agent. It takes approximately 45 lemons to make one 15 mL bottle of lemon essential oil. That’s a whole lot of cleaning power in one little bottle! Read more about the health benefits of lemon HERE. 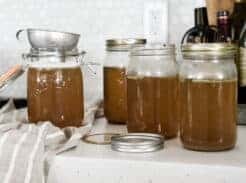 According to this article by Dr. Axe, the U.S. Department of Agriculture conducted a study that found when lemon essential oil was added to foods, it protected the food from human pathogens, like E. coli and Salmonella. You can see how the combination of these two essential oils are effective against tough stains and germs in the home. 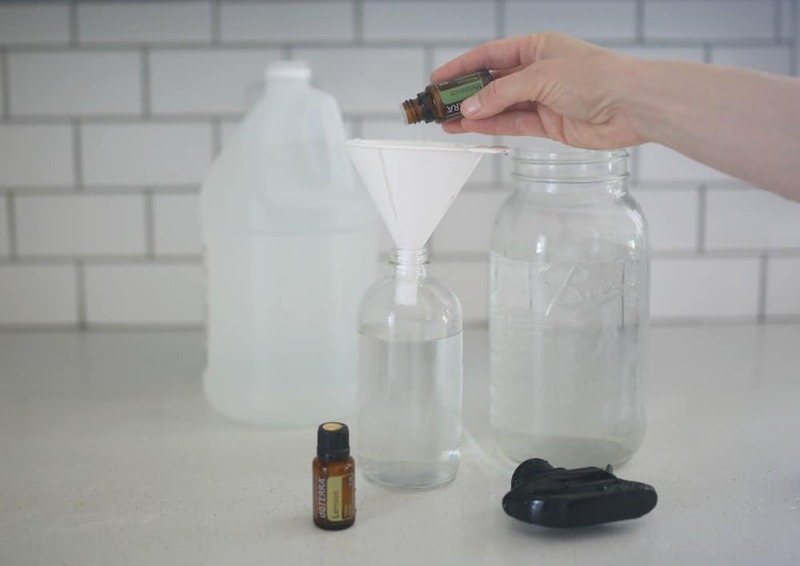 Essential oils are powerful enough to break down plastic, so it is best to store your homemade cleaning supplies in glass spray bottles. I use these 16 ounce glass bottles from Amazon. Use this spray anywhere you would normally use an all purpose cleaner. 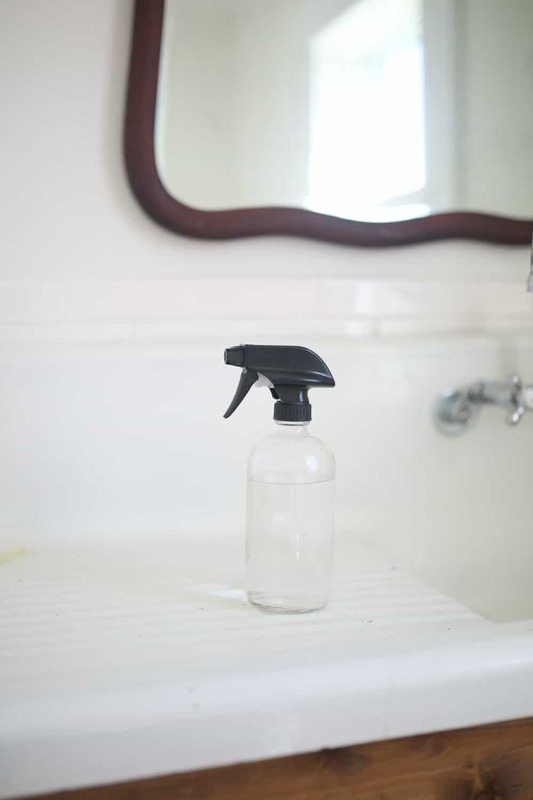 Kitchen counter tops, vanities, floors, the refrigerator, tables, and the kitchen sink are all great places to try out this spray. Combine all the ingredients into your glass bottle with a funnel and give it a good shake. 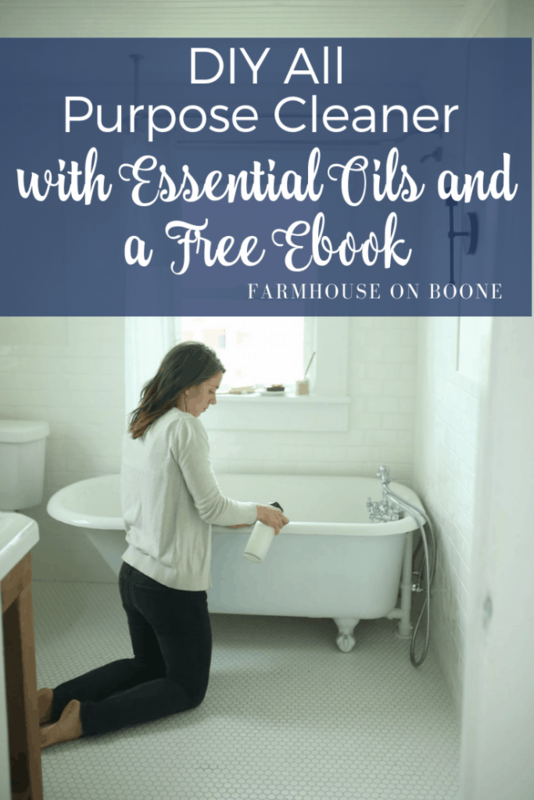 Do you want to get started with using essential oils? Do you have any diy gift ideas for men? I don’t, but that sounds like a good idea to think through for next year! Hi! I tried getting your free ebook but I haven’t gotten an email to confirm my email address! Hello Lisa, could you please send me your free e-book of recipes for diy cleaning products again, I seem to have lost it. ? Im new to your website but have checked out your videos and love them! Looking forward to trying your recipes! Tea tree oil is really toxic for pets, do you know of anything I could substitute in the recipe. Love your blog! Thanks so much!! I love your videos on youtube! I made your white chocolate body butter for gifts and it worked out great! I use it regularly as well and I love it. Im wondering, for the home cleaning products, do all citrus essential oils work (lime, tangerine, etc) or only lemon? Also, have you made a homemade shampoo recipe for yourself? They all work great! Lemon is my favorite, because its cheapest and really seems to cut the grime. But, I have used bergamot, orange and lime all with success. I haven’t successfully made a shampoo but its something I would like to try. I want to try to make it with soap nuts. 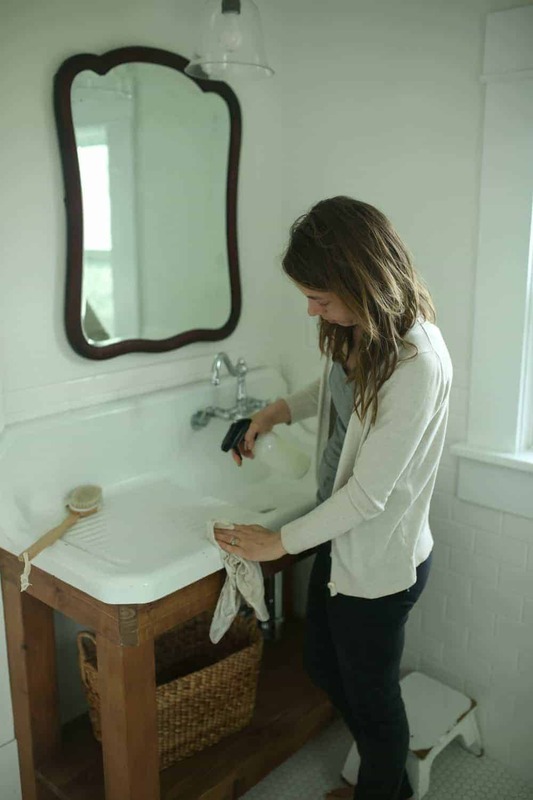 I used essential oils for my natural cleaners, and used glass spray bottles. But after using them a few weeks, the essential oils had destroyed the plastic sprayers. Any suggestions? I’m not sure if you’ve addressed this elsewhere Lisa, but would you mind sharing where you get your glass spray bottles? I have a frustrating relationship with spray bottles in general (they never seem to hold up). 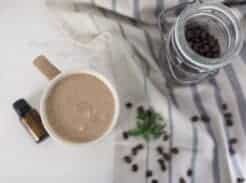 I love your blog and YouTube videos, so inspiring!! !